experienced What’s in the Bible? Volumes 1-9, or used as a primer before beginning Volume 1. The Old Testament Review Curriculum Volume contains 4 weeks. 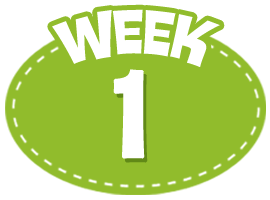 Week 1: The children will review the stories of Genesis and discover God’s great rescue plan. 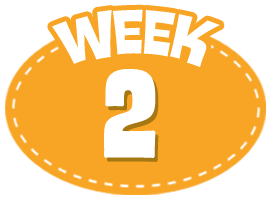 Week 2: The children will review the stories of Exodus, Leviticus, Numbers, Deuteronomy, Joshua, Judges and Ruth. 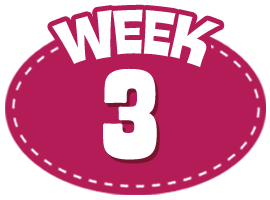 Week 3: The children will review the stories of 1 & 2 Samuel and 1 & 2 Kings. Week 4: The children will review the stories of 1 & 2 Chronicles, Ezra, Nehemiah, Esther, Job, Psalms, Proverbs, Ecclesiastes, Song of Solomon, Lamentations and the Prophets. Video 1 Old Testament Summary Buck Denver summarizes Genesis in a fun verse! The children will learn this summary by the end of the lesson. Small Group 1 Genesis Story Book Using printable stickers, the kids will make their own Genesis story book, which includes the same summary as the video. Video 2 Learn: What's in the Bible? Introductory video covers what the Bible is, who wrote it and how many books it has. Small Group 2 Pictures Tell the Story This discussion game has kids answer questions about pictures of parts of the Bible. Video 3 Learn: Creation through Moses This video covers the stories of Genesis and Exodus and focuses on the patriarchs. Small Group 3 Buck Denver Bungee Rescue The children answer questions to receive paper clips and rubber bands, which they use to make a Buck Denver Bungee! Video 4 Chester Whigget's Music Review A fun musical review of the day's lessons! Small Group 4 Recap & Summary Review the lessons through discussion, and then practice repeating the Genesis summary. Video 1 Old Testament Summary Buck Denver summarizes Exodus-Ruth in a verse. The children will learn this summary by the end of the lesson. Small Group 1 Exodus-Ruth Story Book Using printable stickers, the kids will make their own Exodus-Ruth story book, which includes the same summary as the video. Video 2 Learn: Who wrote the Bible? Sunday School Lady explains how the Old and New Testaments are divided and who wrote which books. Small Group 2 Who Knows the Section? This game encourages kids to find answers to questions in their Bibles. Video 3 Learn: Exodus to Ruth This video reviews the BIG stories from Moses and the Exodus all the way to Ruth! Small Group 3 Hot Air Rescue This active game gets kids up and moving as they answer questions and take turns blowing "hot air" on to get their ping pong balls across the finish line. Small Group 4 Recap & Summary Review the lessons through discussion, and then practice repeating the Exodus-Ruth summary. Video 1 Old Testament Summary Buck Denver reviews the stories of Saul, David and Solomon in this fun Kings & Chronicles Summary. Small Group 1 Three Kings Story Book Using printable stickers, the kids will make their own Three Kings story book, which includes the same summary as in the video. Video 2 Learn: What is the Canon? Cap'n Pete explains the canon, and who chose the books to be in the Bible. Small Group 2 Cap'n Pete's Canon Cards The children will review the video by answering questions using cards with the answers. Video 3 Learn: Three Kings The stories of the first 3 kings of Israel - Saul, David and Solomon. Small Group 3 Art & Discussion The children will discuss and draw images about what they learned. Small Group 4 Recap & Summary Review the lessons through discussion, and then practice repeating the Kings & Chronicles summary. Video 1 Old Testament Summary Buck Denver reviews the stories of 1 & 2 Chronicles, Ezra, Nehemiah, Esther, the Writings & the Prophets with this fun summary. Small Group 1 Chronicles - Malachi Story Book Using printable stickers, the kids will make their own Chronicles - Malachi story book, which includes the same summary as in the video. Video 2 Learn: The Four Sections of the Old Testament Learn about the Pentateuch, Historical Books, Writings and Prophets - the four sections of the Old Testament! Small Group 2 Four Square A fun active game that reinforces the video's content about the four sections of the Old Testament. Video 3 Learn: Ezra to Malachi Discover the kings of Israel and Judah, and hear from the amazing prophets that God had sent during troubling times! Small Group 3 eXile Rescue In this game, kids start in "exile" and answer questions about the video to get out! Small Group 4 Recap & Summary Review the lessons through discussion, and then practice repeating the Chronicles - Malachi summary.